A hammertoe is a contracture of the toes as a result of a muscle imbalance between the tendons on the top and the tendons on the bottom of the toe. They can be flexible or rigid in nature. When they are rigid, it is not possible to straighten the toe out by manipulating it. Frequently, they develop corns on the top of the toe as a result of rubbing on the shoe. They may also cause a bothersome callous on the ball of the foot. This occurs as a result of the toe pressing downward on the bone behind the toe. This area then becomes prominent and the pressure of the bone against the ground causes a callous to form. 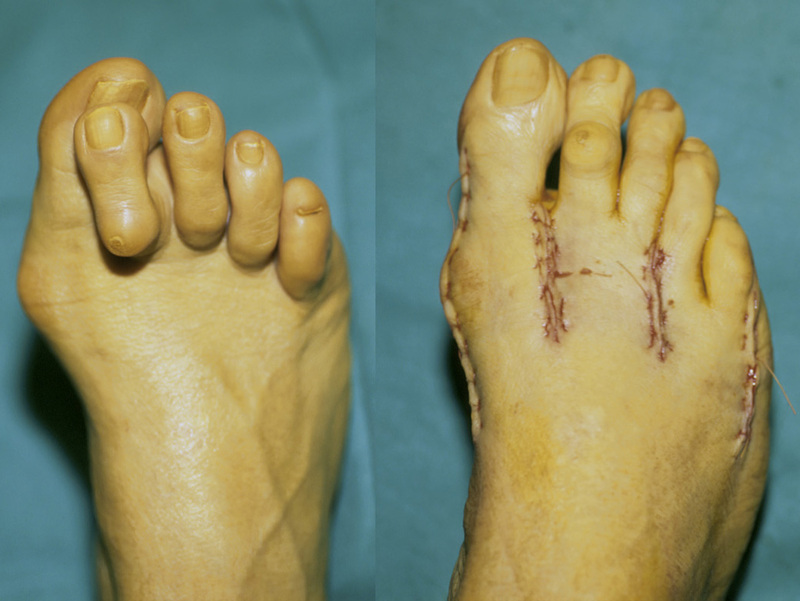 Prescription strength medicines to hammertoe decrease pain and inflammation. Physical Therapy. To strengthen poorly functioning muscles and stretch tight muscles that may be exacerbating the toes. Special ultrasound techniques may reduce inflammation. Custom Foot Orthotics. An orthotic with an exact mold of your foot to better align and support the foot to ease current discomfort and prevent future progression. Toe Splints or Pads. Specific pads may prevent pressure and physical irritation in shoes. Toe splints and toe spacers physically realign the toes and can lessen pain and halt or stall hammer toe progression. Cortisone injections are strong anti-inflammatory agents to decrease pain, and swelling directly at the toe region. Injections only treat the symptoms, and in some cases used in caution (and sparingly) they can weaken supporting ligaments of the toe(s).